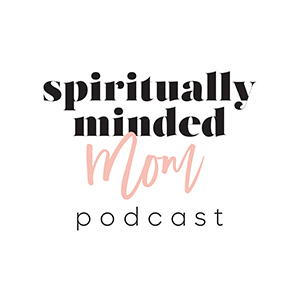 Episode 46 is the fifth and final episode in a 5-episode series on becoming more spiritually minded. The purpose of the series is to help you figure out how God speaks to you as well as learn how you receive personal revelation. 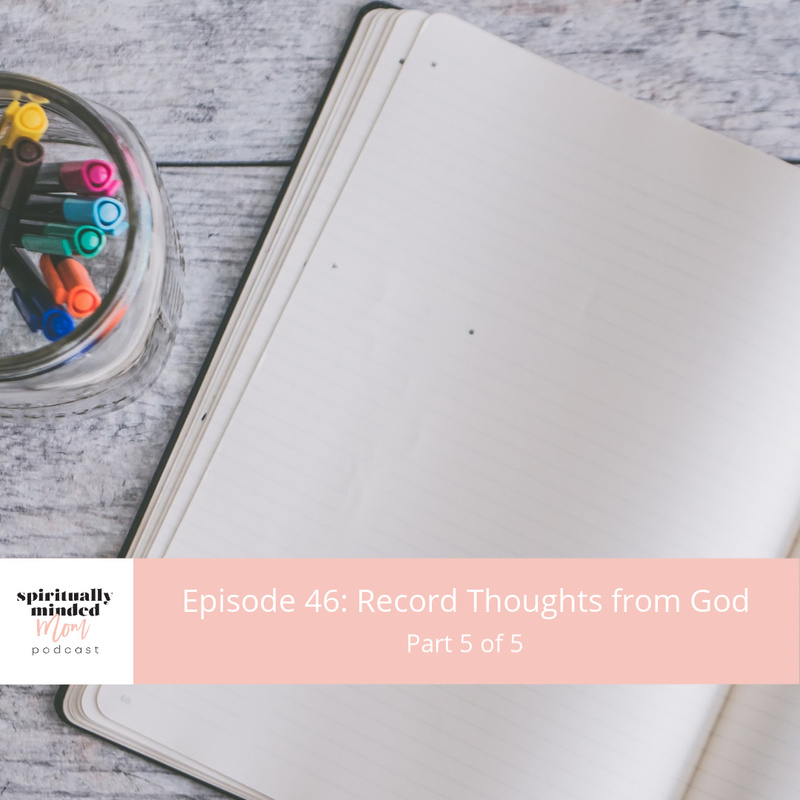 Today’s topic is: Record Thoughts from God. Write the thoughts that come to your mind. Record your feelings. The printable for this week’s episode will give you the chance to ponder on how you have seen and felt God as your partner in motherhood. The act section of the printable is an invitation to you to start recording spiritual thoughts, impressions, feelings and tender mercies from God. 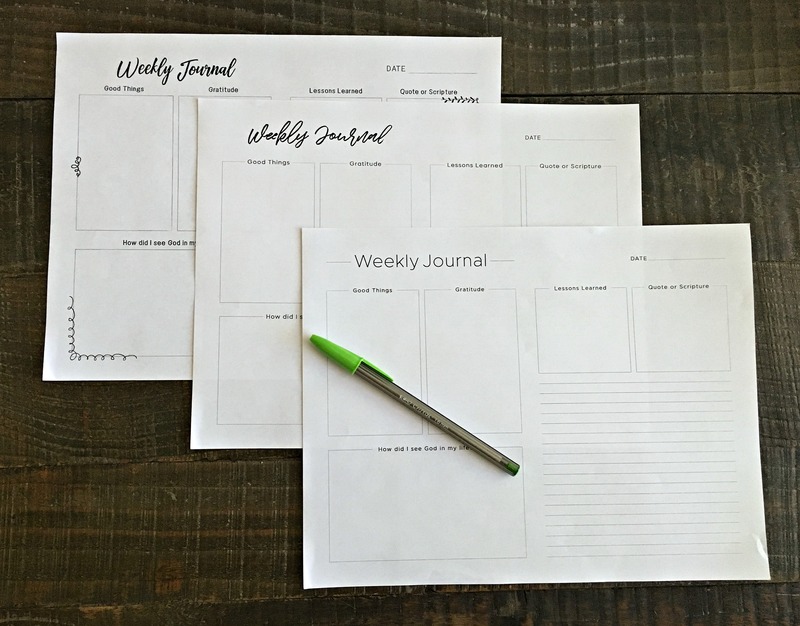 The printable also includes journal templates to help you get started. There are three different templates but they are basically all the same. You can pick the one you like the best. Preserve the integrity of the message. Preserve the feelings of the moment. I took these topics from an article written by Tad Callister from a Church News article from October 24, 2017 called Record Spiritual Insights to Receive More Revelation in Your Life. I hope you have enjoyed this five-part series. Hopefully, something you have heard or written onthe printables has helped you come closer to God. Listen to the podcast below or on iTunes, Spotify, Google Play, Stitcher or Sound Cloud. If you like the show, please subscribe and leave a review. Download the printables for each episode HERE. Find part 1: Seek a Relationship with God HERE. Find part 2: Build Spiritual Reserves HERE. Find part 3: Use God as a Guide HERE. Find part 4: Act on Promptings Felt from God HERE. To read more about Alma’s experiences writing instructions from God so he “might have them” read Mosiah 26. I was scrolling Instagram the other day and noticed a blogger asking moms to chime in on what a typical day looks like with working, making dinner, shuttling kids to activities and everything else a mom does. Hundreds of moms responded, and I got tired just reading all of the comments. 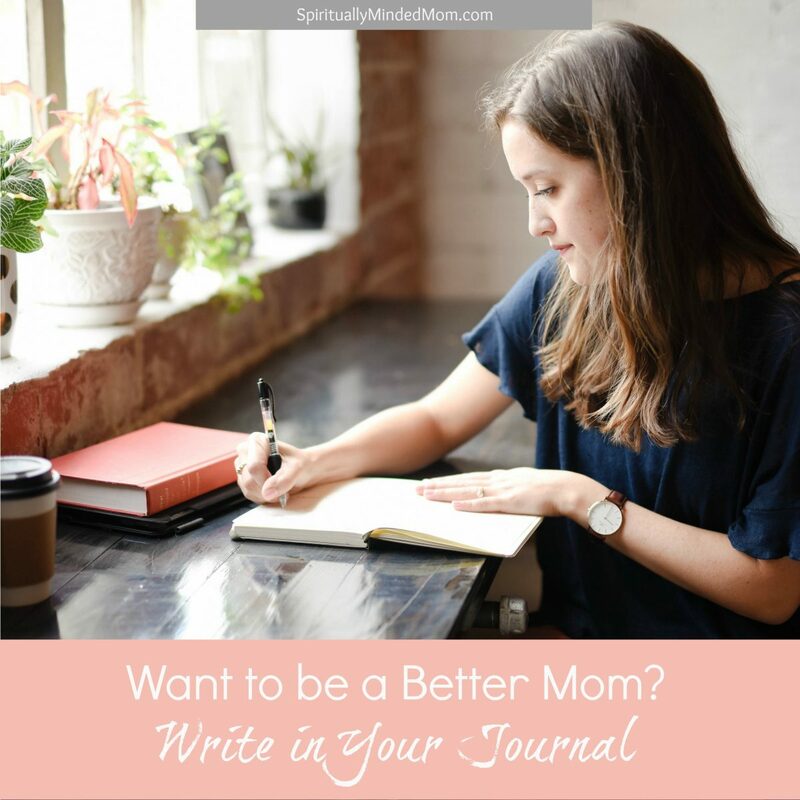 I didn’t see one mom mention “weekly journaling” as one of her top priorities, but journaling is a great way to improve your mothering. I recently read this article about how journaling can help executives improve leadership skills. The article was in Harvard Business Review and is obviously geared towards business leaders but when I clicked over to read it, I couldn’t help but think how the principles the author shares for business leaders also apply to mothers. As a busy mom, wouldn’t you love to be one step ahead (with eyes in the back of your head), sense what your kids are feeling and thinking and take action? And having a little time to “actually listen to ourselves” sounds like a mom’s dream come true! I know what you’re thinking. You’ve tried and failed to write in your journal in the past. Or maybe, you already feel so overwhelmed there is no way you’re going to add one more thing to your busy life. I totally get it. I’m right there with you. Stick with me and I’ll show you an easy format for you to start up your weekly journal writing. First, let’s talk about some of the incredible things you’ll gain as a mother when you take the time to write your thoughts and what’s going on each week. If you’re like me, you’ve got a million things swirling around in your brain. When I have a lot of stuff going on in my life in addition to all of the worries I have as a mom, I open my journal and just start to write. I don’t worry about my handwriting and my grammar. I just write and get everything out of my head and onto the paper. Surprisingly, this practice always helps me understand what I am feeling and helps me see what is truly important and what I might be able to set aside. I always feel God prompting me to write when I am facing big decisions, trying to overcome struggles or going through something that’s going to help me grow. A few years ago, my family faced extreme financial difficulties and I wrote weekly about the frustrations, feelings and thoughts I had about the situation in my journal. Now, when I go back and read about that time, I see so clearly how God was guiding our family. I couldn’t see it when I was going through it, but writing has helped me gain perspective on those trials and shown me that God was right there with me. In addition to perspective, keeping a journal helps you recognize blessings and feel gratitude. Henry B. Eyring, an avid journal writer, shared these thoughts. It will be easier to see your blessings when you are looking for and writing about what God is doing for you in your life. Writing things down will help you remember life lessons you are learning. Last week a teacher at church texted me and asked me to share an experience in her lesson for the next Sunday. I wasn’t sure what to share but turned to my journal and found something that applied to her topic. After I shared the experience I had written about, I realized I may never have remembered the details if I hadn’t written them down. I don’t want to have to repeat the lessons I am learning as a mom and in life. Writing them down means I won’t forget. Now that you know some of the great benefits of writing, here’s an easy way for you to get started. Choose from 3 different templates to print and use. I created a template you can print out weekly to start writing. (Go HERE to get access to the template.) Sometimes it’s hard to get started, so this journal page has space for you to jot down different things. Here’s what you’ll see when you print the template out. Write the memories you have of the week. I like to write the little, mundane things we did like the first swim of the year or that I had to wake my boys up in church three times or that I let my 14 year old back the car out of the garage (and the look on his face was priceless!). It’s fun to go back and remember these little things that I will probably forget later. Write something you learned or thought about. Your lesson could be related to motherhood, a spiritual prompting you felt, something a friend said or anything else. This goes along with the quote from Henry B. Eyring above. It’s important to take time to think about and recognize how you have seen God in your life. When you write it down, you are more likely to recognize the tender mercies the Lord gives you everyday. Write down a few things you are grateful for from the week. 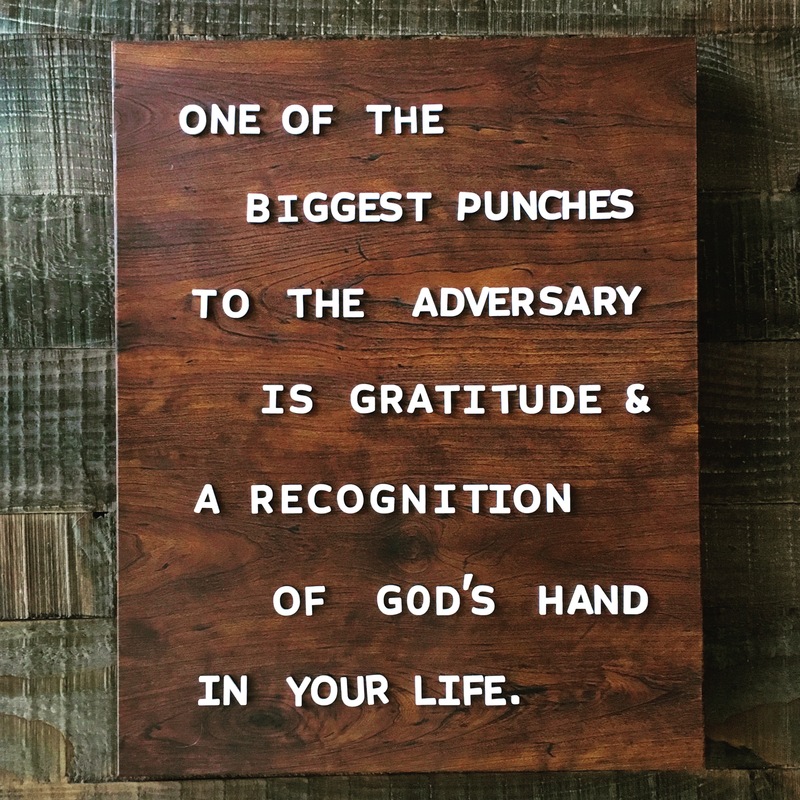 I love this quote by Michelle Gifford, “One of the biggest punches to the adversary is gratitude and a recognition of God’s hand in your life.” Recognizing God in your life and writing down the things you are grateful for will help you keep Satan out. Write a quote or scripture that has stuck out to you during the week. Finally, you have space to write whatever you want. I use this template on a regular basis and some weeks I use this space and some weeks I don’t. The beauty is that filling out the boxes will only take a few minutes and you’ve got a record of your week. You don’t have to fill pages and pages to reap the benefits I mentioned above. You can print the journal template here. I printed mine double sided, cut the pages in half, hole punched them and put them in a cute little binder you can pick up just about anywhere. If you use the template, let me know! Leave a comment or DM me on Instagram. I would love to hear your experiences with journaling.